The 2018 budget showed infrastructure spending being shifted to future years. 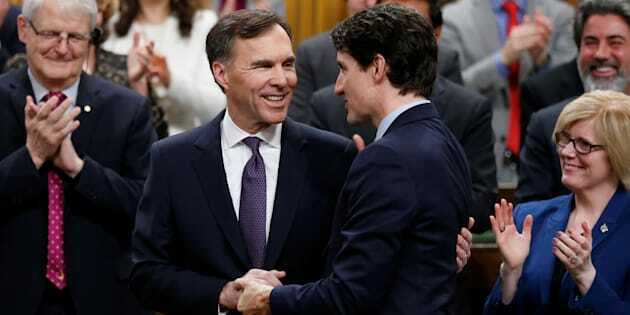 Prime Minister Justin Trudeau shakes hands with Finance Minister Bill Morneau after Morneau delivered the budget in the House of Commons on Feb. 27, 2018. OTTAWA — Parliament's spending watchdog urged the federal government to come clean Thursday on billions of dollars' worth of expenditure outlined in last month's budget that includes little or no explanation — be it on infrastructure, programs for Canadians or the military. The Liberal government's third budget, tabled late last month, showed billions in planned infrastructure spending was being shifted to future years. The document also showed declines in program spending totalling about $16 billion over six years, thereby reducing the government's bottom line. The Liberals provided the Office of the Parliamentary Budget Officer with information to explain why the government believed annual spending would drop by an average of $2.7 billion — but only on the condition that Jean-Denis Frechette's office not release the details. The PBO received no explanation for why the spending information for some departments and Crown corporations couldn't be shared with taxpayers — a condition that stands at odds with other work the Liberals have done to help parliamentarians keep better account of government spending. "Those improvements are there, but in certain areas they are still hesitant to provide more detailed information. What I don't understand is why," said Mostafa Askari, the deputy parliamentary budget officer. "When I look at that information (about the $16 billion), there's nothing there that should be confidential." Finance Minister Bill Morneau's department said some of the information was still subject to government approval, or contained other details not yet approved for public release. A spokesman for the department insisted the budget included a "clear explanation" for budget changes and "unprecedented detail" about spending as part of ongoing efforts to improve transparency. Prime Minister Justin Trudeau and Finance Minister Bill Morneau walk to the House of Commons to deliver the budget on Feb. 27, 2018. Thursday's report casts a critical eye on the budget just days before MPs return to the House of Commons after a two-week break and in the midst of a push to complete funding deals with provinces and territories for $33-billion worth of infrastructure money. The Liberals have repeatedly been forced to defend the slower-than-expected pace of that spending. The distribution of infrastructure funds is often delayed, since dollars don't flow to projects until cities and provinces submit expense receipts, creating a lag between when work takes place and when federal money gets spent. Frechette asked the Liberals for a revised plan on how the federal government will spend $186.7 billion in infrastructure money over the next 12 years, since the budget indicated that about one-quarter of planned spending between 2016 and 2019 was being moved to future years. As a result, spending drops now, but goes up later, Askari said. That plan doesn't yet exist, but the government plans to provide more information beyond what was in last month's budget, the PBO noted. Frechette called the budget details an incomplete account of $91.1 billion in existing spending. Infrastructure Minister Amarjeet Sohi said the majority of approved projects are underway and the government is finalizing plans to provide more details about spending across multiple departments. "We're hopeful that will deal with some of the concerns that the parliamentary budget office has identified," Sohi said Thursday from Fredericton, N.B., where he signed a deal to provide the province with more than $673 million over 10 years. Conservative infrastructure critic Michael Chong said the PBO report shows the Liberals are not living up to their promise to fix roads and bridges and reduce congestion in urban centres. He said the government's plans lacked details. "Not only is there a lack of detail, the plans keep changing," said Chong, who described how spending projections have changed multiple times. NDP infrastructure critic Brigitte Sansoucy said the Liberals must explain how they plan to avoid further spending delays: "People across the country expect to have a full and up-to-date account of the government's $186.7-billion investment plan." Askari said the budget also doesn't provide details on a 20-year spending pledge for the military. Last year, the government promised to spend $62 billion more over the next two decades for a major expansion of the Canadian Armed Forces, with much of the money only flowing after next year's federal election.